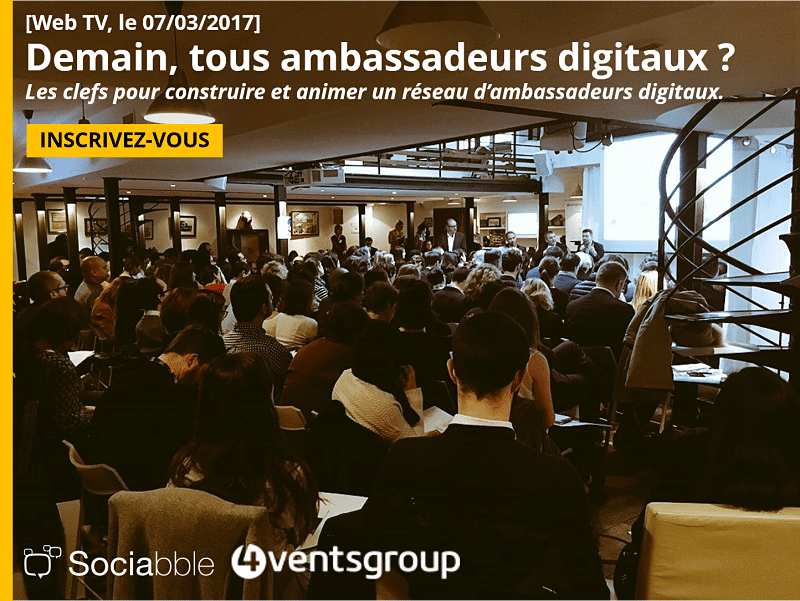 On Tuesday March 7th, and following the roundtable organized on February 1st, Sociabble and 4ventsgroup are organizing a web conference that will bring together the global companies leading the way in enterprise employee advocacy. The web TV, which takes place at 1pm CET (12pm GMT), will present employee advocacy case studies from Adecco Group France, Cushman & Wakefield, Intuit France and Thales Group. Those leading digital transformation at each company will share their expertise and insights; about how an employee advocacy program can be strategically planned and successfully launched at scale within global organizations. For the world’s largest companies, the task of scaling an employee advocacy program that addresses both global and regional needs, and complies with social media and brand communication guidelines can seem daunting. This online conference will shed light on how enterprises can overcome the challenges in launching global employee advocacy; and how they can make the program a success in the long run. Also, please note that the web TV will take place in French. Demain, tous ambassadeurs digitaux ?